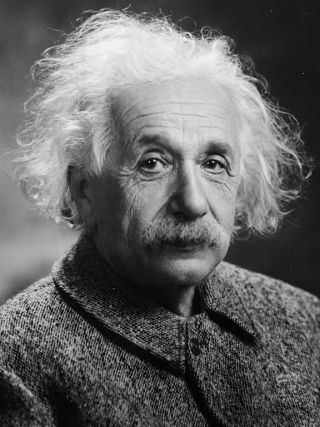 The famous German scientist Albert Einstein would have turned 138 years old today. Einstein, who passed away in 1955, is best known for his theory of general relativity and his mass-energy equivalence formula, E = mc^2. Coincidentally, Einstein's birthday falls on Pi Day. To celebrate, the Space.com team is chowing down on mini-pies with Einstein-themed decorations and sipping on "Albert Winestein" wines, courtesy of National Geographic. Space.com's Hanneke Weitering poses with Albert Einstein party favors from National Geographic. Next month, the National Geographic Channel will premiere its new 10-part television series, "Genius," which stars Geoffrey Rush and recounts Einstein's personal life and professional accomplishments in juicy, dramatic detail. The first episode of the new global event series airs on April 25.